New Colour Palette, Who This? You guys know me – I’m not usually one for colour. This predominately red outfit may seem out of the blue (huh-hey, colour joke!) but honestly, I wasn’t expecting it either. At most, my wardrobe has occasional pops of cream, burgundy and forest green. I don’t have enough colourful clothes that go together to make an outfit that isn’t predominately black! ? …Or at least that was the case until I picked up this gorgeous little sweater. The closet change up is worth it though – this is currently one of my favourite outfits! It may seem like an odd addition to my wardrobe as it’s not normally something I would pick up, so thought I’d share the tale of how it came to be. Truthfully, before this I hadn’t shopped in-store for a few years AT LEAST. I rely on online shopping so much for everything from groceries, to clothes, to the random crap that you buy on a whim (I am the proud owner of several novelty mugs). Add in the fact that I can do this from bed… and you have a winner in my book. However, recently the lovely people at River Island invited me down to take a look at their flagship store (and use their Style Studio dressing rooms, which felt oh-so fancy!). In the time I was there, my appreciation for shopping in-store was completely renewed. It went from something that I actively avoided as I had forgotten the merits of it (my reaction being UGH PEOPLE THO), to something I can’t wait to do again! I’ve popped some of my favourite aspects if it below, if you’d like to take a read. Let me know what you think – do you agree? Or is shopping in-store still something you like to avoid? Under normal shopping circumstances, there is no way I would have popped this jumper in my online basket. 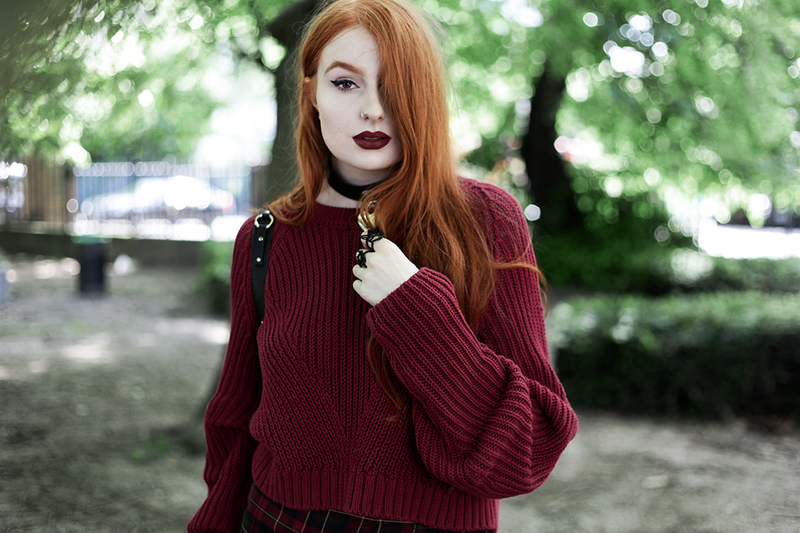 Red rarely works on me – it can look so odd next to my ginger hair! ? However as I was browsing River Island, I fell in love with this gorgeous red sweater with slouchy gathered sleeves the moment my eyes hit it. Praying that the tone would suit me, I grabbed my size from the rack and dashed up to the changing rooms. After slipping it over my head I was so excited to find that IT WORKED!! Just generally, having a way to try things on before you buy will mean you’re less like to return it as you’ve seen the how the colour, shape and fit work on you. You can also try on multiple sizes in a changing room. It’s so much more convenient than having to buy multiple sizes online and then return whichever doesn’t work! Fancy changing rooms really add to that ~luxury~ shopping experience feeling that made me love my recent shopping trip. I think with Insta/snapchat being as huge as they are, companies are really upping their dressing room game. People post so many changing room selfies – pictures in a plush room rather than a poorly-lit cubicle reflects much better on a brand. So for us consumers, this means more luxurious changing rooms for our shopping experience (yay)! If you follow me on Instagram, you may have seen from my stories how fancy the RI Style Studio changing rooms were. The one I was in was big enough for a sofa(!) and had mirrors at various angles so you could see the sides & back while trying on. More of this fancy-ness please! This point sounds a little weird – but hear me out! It may be just me but… does anyone else find themselves filling up their basket with virtual goodies, only to get distracted by something else (be it online, or just around you), so you end up forgetting to check out? This is one of the biggest pitfalls of online shopping for me. Especially as you can go back to something you left in your basket, only to find it is sold out and you’ve missed out forever! You cant really accidentally abandon your basket in-store, so you’re sure to snag that beautiful item before it sells out. I guess it’s good in a way as it stops me spending all my money, but dammit I wanted those beautiful clothes I put in my basket! All this considered, online shopping will probably remain my main vice – it’s too bloody quick and easy! But I think some in-person retail therapy can work wonders to lift your day, and you may even end up finding a new wardrobe addition that you wouldn’t have given a chance otherwise. What do you think? Previous Post Dark Double Denim. Next Post Band Tee & Fishnet Sleeves. Otherwise, that sweater is BEAUTIFUL! I love it! Loving the red tones on you! I’m an avid online-shopper too, but I love going shopping as a way to spend time with friends. It’s awesome you like killstar! I’m in love with their products, especially because their leather is vegan leather. I love shopping online! It’s pretty easy for me to choose a size that’ll fit me. Although, since I’m so short/petite (5’0″) I absolutely HAVE to shop in store for any trousers, except skirts. Even when I try them on in-store, they most likely don’t fit me anyway! ???? I used to not be a red person, but now that I have black hair I feel like it looks better now for some reason haha.